← So, the young men have made their choices…how did Ruff & Crew do? Hi James…thanks for dropping in and leaving a note…always look forward to hearing from other Pirates around the way. You are dead on in putting this season first and not looking past it. We need to leave this league as a 3-time champion (or 4 if you count like I do). Hi Ron… i’m itching for something from you on the new AD… you working on it? Working on it…yes…but will likely be in the magazine. I have some other stuff in the works for here. Hope you are well Chris! Gotta agree Ron. Going with the BE was a no brainer as well as taking ESPN’s offer. Like it or not a football league that is not aligned with ESPN is going to have a rough time recruiting those kids who are dreaming of being on that stage one day. This keeps us from falling farther behind in the recruiting pecking order. Hope you have been well since your last visit. You know, the recruit angle is a big one that I did not touch on in this post…like Nike, Gatorade, Under Armour and the like, ESPN is a status symbol for the kids…100% agree on that point. I agree with you on moving north with our recruiting efforts. There is just way too much competition down south to make it financial feasible. It seems to me(and I maybe wrong) that the north is a lot more wide open as far as the quality of athlete you can get. Getting our brand out there is very important and I agree that a major campaign should be started. ESPN is cool and I think they migrate to us because our brand is cool also. You underestimate that fact. The athletic department and Pirate Club has done a good job making our brand cool with new logos, uniforms, etc. Be it is time to ramp it up to another level. I think with this generation, it is almost as important how you market your brand as it is what conference you are in or where you are located. Coolness gets you exposure(blue turf at Boise State) but you gotta back it up with W’s. That’s why I still believe that 2013 is so huge for us in football. 7-5 or 8-4 ain’t gonna cut it. With what we have coming back, 10-2, 11-1 or ,can I dream, 12-0 is what we need. Definitely agree on your thoughts here NQ…not only on the how immensely important 2013 season is in terms of W-Ls, but also in regards to taking our brand to a new level. I think that our inclusion in the Big East was a part of the ESPN desire to get the contract…I do. I also think that ESPN is just being the business machine it is and seized on a listing conference to low ball the contract. There will be renegotiations in the future if the BE can produce quality. With what we have coming back – if Rick Smith can instill some quick changes – we should be expecting a 10-win season. Cheers and thanks for dropping by NQ! Though I absolutely loathe ESPN, we did the best we could with the deal if money isn’t considered. I have come to hate ESPN and its ways, too, but we had to have them. I do think that re-negotiations will follow should the BE play up to a higher level this year or next. Thanks for commenting UV…always have great interest in your thoughts/insights. I once heard a sermon that stuck with me. The preacher said that the Devil had no more power over you than you let him have. As Bobby Boucher’s Mama would say, “ESPN is the Devil!” But our worst enemy right is our own fans and our brethren fans from the Big East. We helped the Devil deliver the blows. ESPN’s beat down of the Big East was further fueled by our own media outlets. As one writer recently penned in an article I read, “lazy sports journalists just can’t resist writing yet another easy sensationalized story about the demise of he Big East”. UCONN and Cincinnati shot themselves and the conference in the foot applying for the ACC “27” times. We have an ECU poster on the Big East board that has made it his life’s mission posting “Fire Aresco” polls when it was Aresco and his friendship with Terry Holland that got us out of “low-major” football and into the Big East. It’s not even a debate whether we are better off today than a few short months ago. The total conference revenue from the new Big East is projected to be over $7,000,000 with the new ESPN TV contract combined with bowl playoffs, NCAA basketball credits, and BCS play off money. The TV money wasn’t there because the brand teams have left. WVU, Pitt, Rutgers, Syracuse, BC and even lowly Louisville have “left the building, thank you and good night”. UCONN and USF are Johnny-come-latelies in football while Cincinnati is a resurrected has-been. These are not household names. But here’s the good news. This is a solid conference that can grow into something special. Unlike the Mountain West that only has wasteland and coyotes between mid sized TV markets, the new Big East doesn’t have a weak link that can’t produce and contribute to the conference. We are not BCS power conference, but it is as close as we can get. This conference will produce another Virginia Tech. The quicker our fans accept that the Big East has taken a hit and that we need to move on with it, the sooner we will become the next Virginia Tech. Hi Coby…thanks for the comment. Some great points in there. I never expect to get much help from local journalists…but I think your point about our own fanbase is a very important one. We are better off today than we were yesterday and should regroup so that our efforts are focused forward whatever the TV deal was. It is more than we had with a greater upside based on the teams we are now grouped with. The travel costs are a big issue and what we save in that bucket alone will directly benefit our program. Hopefully, we are an all-sports member sooner than later. And, as you point out, the group that is the new big east (or whatever it will be called) cannot complain about markets…there are big ones to be mined. Rather, we should be (and I hope my post hit on this) giving thought how we can increase our brand in these big markets. I firmly believe that the MWC has topped out or is close to its cap in terms of TV contracts whereas – with the markets we span – ECU’s new conference – if the teams perform – will seize back some measure of negotiable power. This contract will likely be revisited in two or three seasons (provided these teams can rise a bit). Anyway, thanks for dropping in Coby. Love to hear your analysis on all topics ECU. there have been a lot of good ideas to increase our brand…but the most important thing is to win big in football. 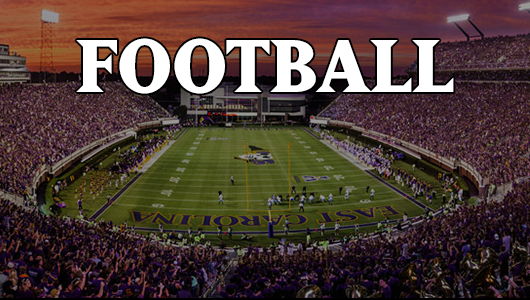 if ECU would become a power in football we would not have to worry about exposure. if we resemble the team we put on the field the last three years, our brand will not only decrease but hurt the conference we belong to. the schools that have left us behind, all have one thing in common…winning! thanks for your article Pharma, you made some interesting points. Hi rc…that one does trump them all. Win and things go your way. Going to the BE was the only play we could make. There is no question staying in C-USA would be far worse than moving on. I mean no disrespect to those schools (after all, a Sun Belt team just whipped us in the bowl) but C-USA has accepted it’s role as a stepping stone. The new BE, for all its faults, does have the markets and commitment to compete and make something of the conference. I’m not sure I’m on board with all the ESPN bashing…they do what will make them money. If the remaining BE teams could generate the revenue, then the contract would be larger. That said, your comment about the MWC is spot-on; you can see the ceiling on the MWC but the potential upside is much higher for the BE given the large markets. Hope you and your’s are doing great!